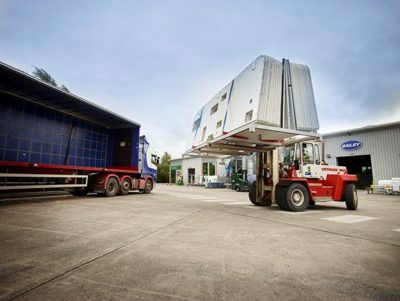 Bailey of Bristol has relocated its large panel laminating plant to a new state-of-the-art site in Clevedon, North Somerset. 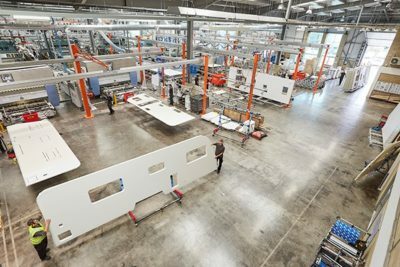 The new production plant is now capable of producing a finished fully laminated body shell panel for a caravan or motorhome every two minutes, making it the most advanced facility of its kind in the industry. Housed in a modern 3,250+ square metre manufacturing building, it accommodates four state-of-the-art laminating lines, capable of producing more than 1,500 floor, side and ceiling panels each week. The move is part of a larger plan to redevelop the company’s South Liberty Lane production facility and is the second business unit to be moved from their main site – the Bailey Parts Direct operation moved to North Bristol 12 months ago. All Bailey caravans and motorhomes are manufactured using the company’s patented Alu-Tech construction system, which, uses fully bonded laminated panels throughout the assembly. This gives the overall structure far greater strength and rigidity as well as providing the vehicle with superior thermal insulation properties. Bailey has invested £2 million in the latest computer controlled capital equipment to enhance both production efficiency and accuracy. The manufacturing process begins with the assembly of the panel components on a laser-guided jig for improved accuracy and consistency. This assembly is then bonded together using a bead application system featuring a water-based agent to provide a superior bond, before the panels are then individually loaded into separate ‘multi-daylight’ vacuum presses – again to maximise bond integrity. Once the lamination process is complete, the body shell panels are machined for final assembly on a fully automated CNC router. 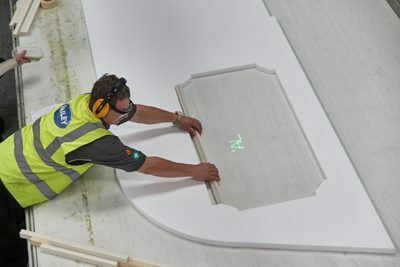 Deliveries of the panels are made daily to the company’s main production facility in South Bristol and monthly to its Australian plant in Melbourne. Managing Director of Bailey, Nick Howard, said the relocation of their large panel laminating plant to larger purpose-built premises off-site was one of a series of initiatives to move their business and the industry forward. “New investment in state-of-the-art manufacturing equipment and a skilled salaried work force will also make sure that we continue to offer new and existing customers a premium product to help fuel further growth in demand for Bailey leisure vehicles,” he added. Look out for more on the production of a Bailey caravan when we report back on our factory tour in June 2017.